This view shows a close up of toward the south polar region of Saturn's largest moon, Titan, and show a depression within the moon's orange and blue haze layers near the south pole. NASA’s Cassini spacecraft snapped the image on Sept. 11, 2011 and it was released on Dec. 22. Titan is Saturn's largest moon and the second largest in the solar system (after Ganymede of Jupiter). It is the only moon in the solar system with clouds and a dense, planet-like atmosphere. Scientists think conditions on Titan are similar to Earth's early years (the main difference is that, because it is closer to the sun, Earth has always been warmer). According to NASA, "In many respects, Saturn's largest moon, Titan, is one of the most Earth-like worlds we have found to date." An orange haze surrounding Titan kept its surface a mystery for Earth's scientists until the arrival of the Cassini mission in 2004. Titan's atmosphere extends about 370 miles high (about 600 kilometers), which makes it a lot higher than Earth's atmosphere. Because the atmosphere is so high, Titan was thought to be the largest moon in the solar system for a long time. It wasn't until 1980 that Voyager was close enough to discover it was actually smaller than Ganymede. Titan's atmosphere is active and complex, and it is mainly composed of nitrogen (95 percent) and methane (5 percent). Titan also has a presence of organic molecules that contain carbon and hydrogen, and that often include oxygen and other elements similar to what is found in Earth's atmosphere and that are essential for life. There is an unsolved mystery surrounding Titan's atmosphere: Because methane is broken down by sunlight, scientists believe there is another source that replenishes what is lost. One potential source of methane is volcanic activity, but this has yet to be confirmed. Titan's atmosphere may escape to space in a similar way that Earth's atmosphere does. The Cassini spacecraft has detected polar winds that draw methane and nitrogen (charged with interactions with light) out along Saturn's magnetic field and out of the atmosphere. A similar process is believed to happen on Earth with our own magnetic field. "At Saturn's largest moon, Titan, Cassini and Huygens showed us one of the most Earth-like worlds we've ever encountered, with weather, climate and geology that provide new ways to understand our home planet," says NASA's Jet Propulsion Laboratory website. There is an abundance of methane lakes, which are mainly concentrated near its southern pole. In 2014, scientists found a transient feature they playfully referred to as "Magic Island." It's possible that nitrogen bubbles formed in Titan's oceans sit on the surface for a period of time, creating a temporary island that eventually dissipates. "What I think is really special about Titan is that it has liquid methane and ethane lakes and seas, making it the only other world in the solar system that has stable liquids on its surfaces," Jason Hofgartner, a planetary scientist at Cornell University, told Space.com in 2014. "It not only has lakes and seas, but also rivers and even rain. It has what we call a hydrological cycle, and we can study it as an analog to Earth's hydrological cycle — and it's the only other place we know of where we can do that." Large areas of Titan's surface are covered with sand dunes made of hydrocarbon. Dunes on Titan may resemble the Namibian desert in Africa. Because methane exists as a liquid on Titan, it also evaporates and forms clouds, which occasionally causes methane rain. Clouds of methane ice and cyanide gas float over the moon's surface. "Titan continues to amaze with natural processes similar to those on the Earth, yet involving materials different from our familiar water," Cassini deputy project scientist Scott Edgington, of NASA's Jet Propulsion Laboratory in Pasadena, California, said in a statement. Sunlight is quite dim on Titan, and climate is driven mostly by changes in the amount of light that accompanies the seasons. As more planets have been found outside of the solar system, Titan has served as a model of cloudy bodies. Examining the atmosphere of the moon has helped scientists to understand the atmospheres of these distant systems. "It turns out that there's a lot you can learn from looking at a sunset," said Tyler Robinson of NASA's Ames Research Center in a statement. The Huygens probe landed via parachute on Jan. 14, 2005. Because of Huygens's observations, Titan became a top priority for scientists. The mission has achieved excellent results, such as taking the highest resolution images ever achieved of this moon´s surface. During its primary and extended missions, Cassini was able to get fundamental data about Titan's structure and the complex organic chemistry of its atmosphere. It is because of Cassini's findings that scientists suspect the presence of an internal ocean composed of water and ammonia. The spacecraft has also spotted seasonal change, such as when an ice cloud formed in Titan's southern hemisphere in 2015 (suggesting that winter was going to be harsh in that zone). The focus of the mission, as it relates to Titan, was to find signs of seasonal changes and volcanic activity. Titan played a dominant role in Cassini's planned ending. The massive moon provided the gravitational boost the spacecraft needed to thread between Saturn's rings in its final months, exploring a never-before-seen region. Titan's boost, which came more than four months before Cassini's suicide plunge, was the point of no return, increasing the spacecraft's velocity by approximately 1,925 mph (3,098 km/h) with respect to Saturn. "With this flyby we're committed to the Grand Finale," Earl Maize, Cassini project manager at JPL, said in a statement after the April 2017 flyby. "The spacecraft is now on a ballistic path, so that even if we were to forgo future small course adjustments using thrusters, we would still enter Saturn's atmosphere on Sept. 15 no matter what." After this major boost, the spacecraft continued to use Titan to tweak its orbit, making its final close approach to Titan on September 12, 2017. Over its 13 years orbiting Saturn, Cassini made 127 encounters with the moon, some close and others more distant. "Cassini has been in a long-term relationship with Titan, with a new rendezvous nearly every month for more than a decade," Maize said in a separate statement "This final encounter is something of a bittersweet goodbye, but as it has done throughout the mission, Titan's gravity is once again sending Cassini where we need it to go. Experiments on Earth suggest that Titan could be more habitable than previously thought. Complex organic chemicals once thought to hover high in the atmosphere may lie closer to the surface than estimated. "Scientists previously thought that as we got closer to the surface of Titan, the moon's atmospheric chemistry was basically inert and dull," Murthy Gudipati, the paper's lead author at JPL, said in a statement. "Our experiment shows that's not true. The same kind of light that drives biological chemistry on Earth's surface could also drive chemistry on Titan, even though Titan receives far less light from the sun and is much colder. 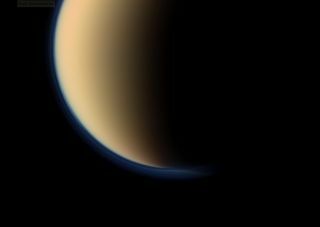 Titan is not a sleeping giant in the lower atmosphere, but at least half awake in its chemical activity." NASA's Cassini spacecraft peers through the murk of Titan's thick atmosphere in this view, taken with Cassini's narrow-angle camera on Sept. 25, 2008. Titan's name comes from Greek mythology. The Titans were elder gods who ruled the universe before the Olympians came to power, according to the Theoi Project website. Titan's diameter is 50 percent larger than that of Earth's moon. Titan is larger than the planet Mercury but is half the mass of the planet. Titan's mass is composed mainly of water in the form of ice and rocky material. Titan has no magnetic field. Surface pressure: Slightly higher than Earth's pressure. Earth's pressure at sea level is 1 bar while Titan's is 1.6 bars. Orbital period: Nearly 16 Earth-days. Titan is tidally locked in synchronous rotation with Saturn, keeping one face turned to the planet as it orbits.